Snack attack: According to sociologist and feeding expert Dina Rose PhD, snack time is the best time to help your kid learn to eat healthy foods. Rose proposes we rotate fruits, veggies, yogurt, and even crackers or granola bars each day during snack time to add variety and nutrients to the children’s diet and to help them eat less healthy snacks in moderation. This will also allow you to provide exposure to healthy foods. Remember that it can take up to 15 exposures to a specific food for your toddler to try or like a certain food. My little chef: Maya Adams MD, avid child nutrition advocate, advices moms to take their children to the farmer’s market or fruit and veggie section of the grocery store and have them help pick out ingredients for delicious meals. This provides a fantastic moment to teach little ones what apples look and taste like, show them unpeeled oranges, and talk to them about how beets can “paint” a plate. Then, once home, take them with you to the kitchen and get them involved. Have them mix ingredients or toss ingredients into the skillet or blender, and even let them assemble their plate to give them a sense of control. 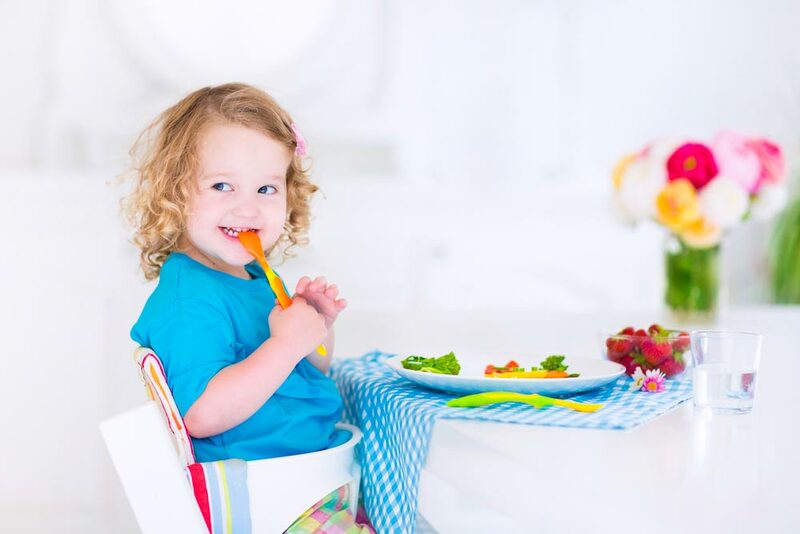 Role model: Studies have shown that toddlers are less likely to eat vegetables if their parents didn’t consume them or they identified their children as being picky eaters. This shows us the importance of modeling healthy eating behavior and not labeling our children. So, show your toddler your love of greens and surround him with healthy eaters. Offer him a bite of what you are having or describe the taste. Let him be curious, play with him and set a plate of soft carrots and dip by your side. Who knows, chances are he might try it out! Choices galore: If your toddler does not want to eat strawberries on their own, why not try a smoothie and strain it if necessary. As stated by Dr. Sears, there are lots of ways to help make mealtime more fun and delicious. Offer dips (yogurt, cottage cheese, nut butters) for fruit and veggies. Teach them to spread these same dips on apple slices, toast, or crackers. Top food with cheese or guacamole, or sprinkle cinnamon onto baked apples. Be creative and let your child “decorate” his food his own way. Finally, remember to be patient and take introduction to new foods one step at a time. Toddlers are learning to interpret and control their world as they grow, and this might include food rejection. But don’t give in, keep offering a wide variety of healthy choices, set scheduled routines, don’t bargain or bribe with desserts, and get your toddler involved. Remember to make eating fun and keep mealtime-stress to a minimum. On the other hand, if you fear your toddler is not growing appropriately or gags and vomits constantly when introduced to a new food, talk to your pediatrician. He/She will help identify any underlying medical condition or give you a specific feeding plan for your child. Let us know how these tips work out and keep a look out for more tips and tricks to combat picky eating coming soon in our App! Picky/fussy eating in children: Review of definitions, assessment, prevalence and dietary intakes. Prevalence of picky eaters among infants and toddlers and their caregivers’ decisions about offering a new food. Toddlers are learning to interpret and control their world as they grow, and this might include food rejection. But don’t give in, keep offering a wide variety of healthy choices, set scheduled routines, don’t bargain or bribe with desserts, and get your toddler involved.